← Did Cupid Like Chocolate? Although I have been quiet lately, I haven’t disappeared. I have just been caught up in the whirlwind of having twins that will graduate from high school next month. It has been very busy around our house lately but very exciting. We have been working on college applications and waiting on those acceptance letters. We will have one going to UNC and another to Auburn. I could put together a “To Do List” of 100 things to do between now and then but I am just trying to take it one day at a time. To say that Mr. 25th Hour Gal and I are proud of these two is an understatement. We are so excited about their future and look forward to watching them discover it. Recently we took our last “Spring Break” trip together on a cruise. We love cruising and this last one was so much fun! I once was a member of OPA (Over Packers Anonymous) Club but with some work and patience I am now a very strategic packer for trips. I am trying to avoid letting the twins go down the wrong path to OPA and I am proud to say that they seem to have successfully avoided it so far. 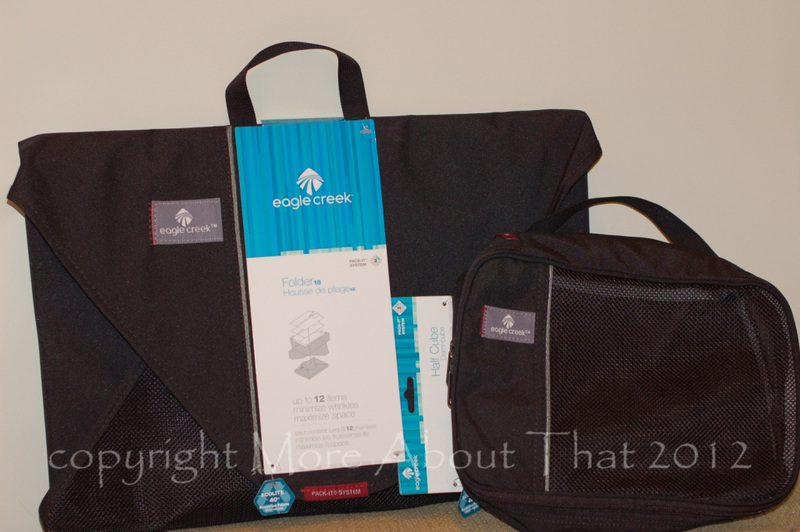 I want to share one of my favorite travel products of all time, the Eagle Creek Packing System. This system will turn even the president of the OPA Club into an organized packing nerd. 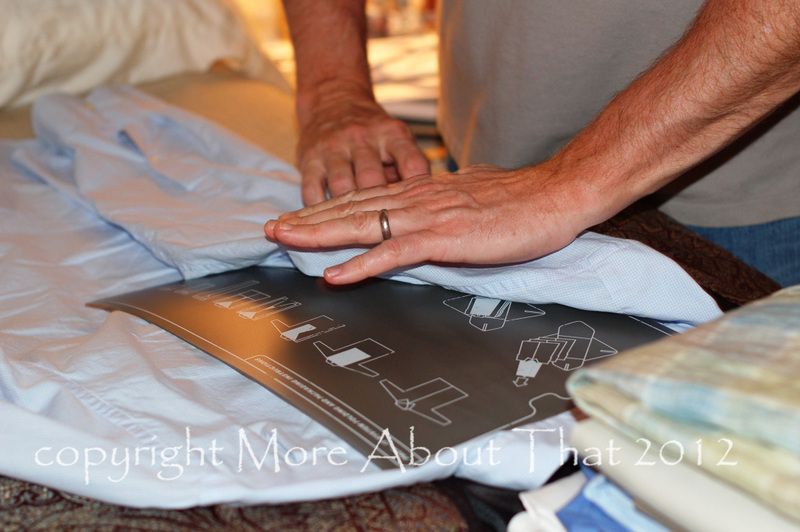 I use a several of the Eagle Creek Packing products including the cubes for underwear, swimsuits, PJ’s, belts, etc. 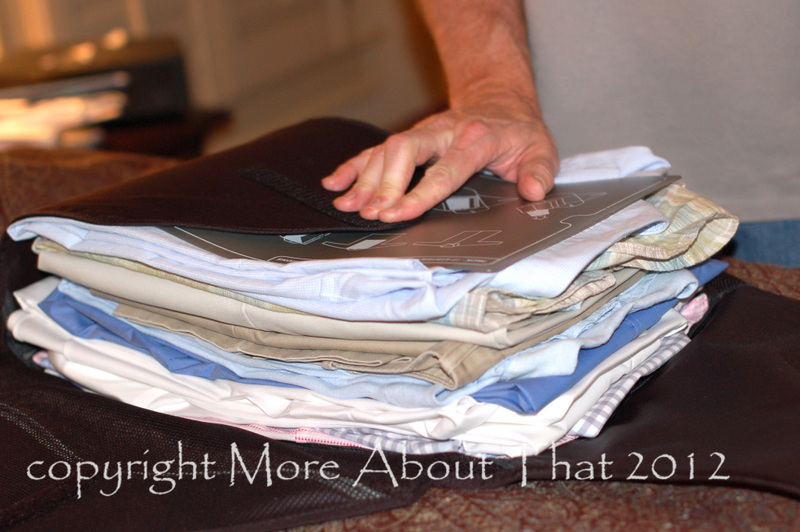 and the Pack-it Folder 15 for most of my clothes. Mr. 25th Hour Gal uses the Pack-it Folder 18 for his. First I put together a packing list and then I pull everything out of the closet that I plan to take. So here is a look at my clothes that I pulled out of the closet. With the Pack-it Folder, they provide an easy to follow folding mat that shows you exactly how to fold your shirts, dresses and skirts so that they are all the same size. You fold each one and stack them on top of each other. As you stack them, you slide the mat out of the item on top to use for the next item. 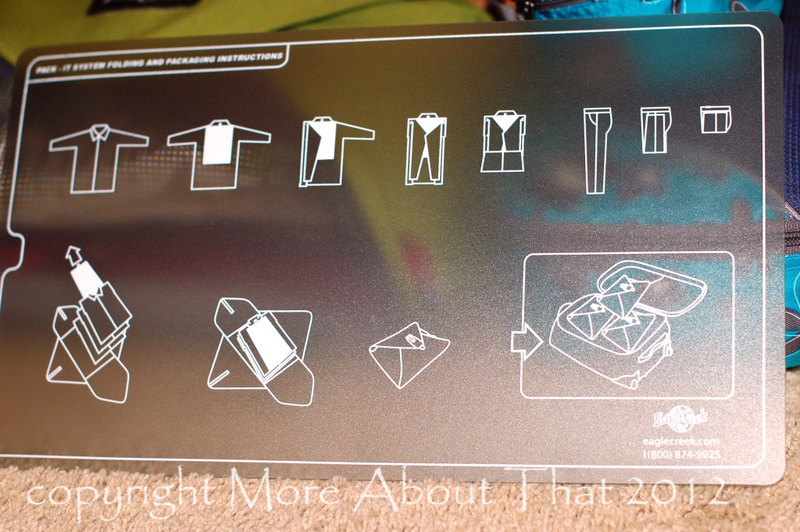 Step 2 – Continue to follow the instructions on the packing mat until the item is completely folded. 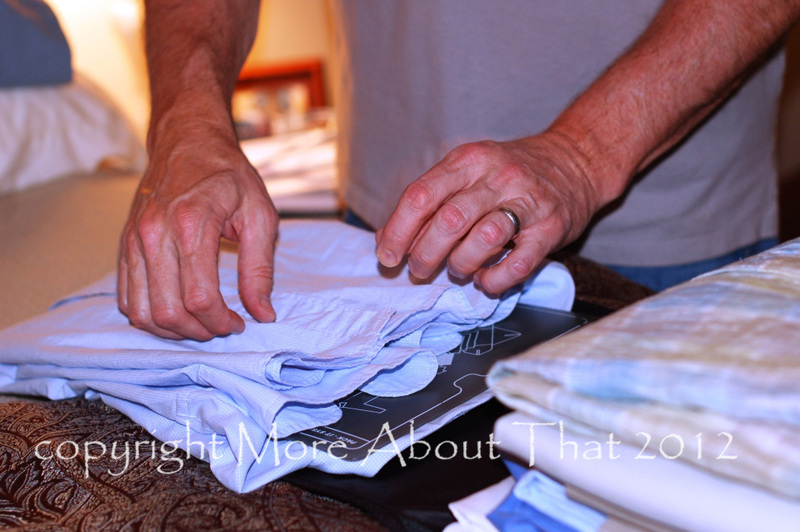 Flip it over and lay it on the stack of other folded items and slide the packing sleeve out the top. Step 3 – When you have folded all items, lay the packing mat on top before closing up the Packing Folder. Step 4 – Close the two ends first and then the sides of the Packing Folder. ALL DONE! Everything I had pulled out of the closet is now packed and ready for the suitcase. Hard to believe that everything fits into these Packing Folders and Cubes but it does! Another great thing about this system is that if you get to the airport and you find that your luggage is 5 lbs over weight, you can simply slide a folder or cube out of your luggage to reduce the weight. Just carry on the folder or cube. Of course, I know that once you embrace using a packing list, you won’t fall into the ugly zone of overweight luggage. I also find that with using this system that my clothing is not nearly as wrinkled by the time I arrive at my destination because it doesn’t move around as much. When you are ready to return from your trip, you can put everything back the way your originally packed it. I also like their Compression Pack Set for dirty clothes, wet swimsuits, etc. 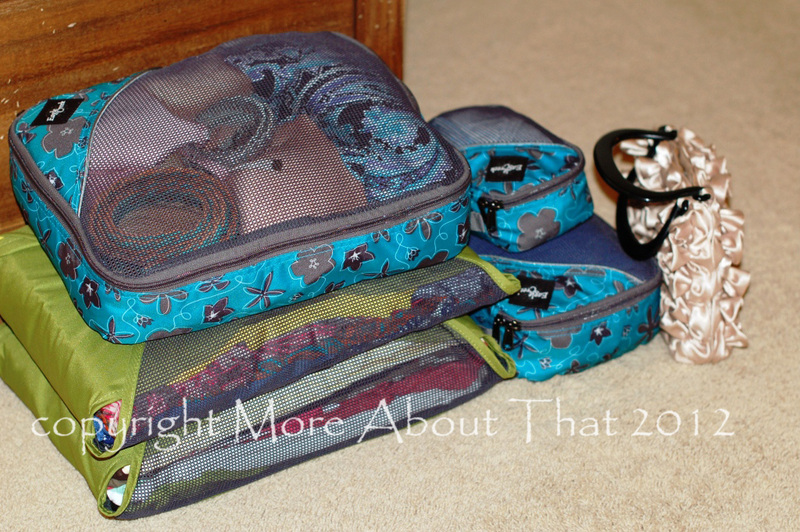 Just add your clothes to the bag and squeeze the air out and throw it in your suitcase. Traveling (and life) is a lot more fun without a lot of baggage! 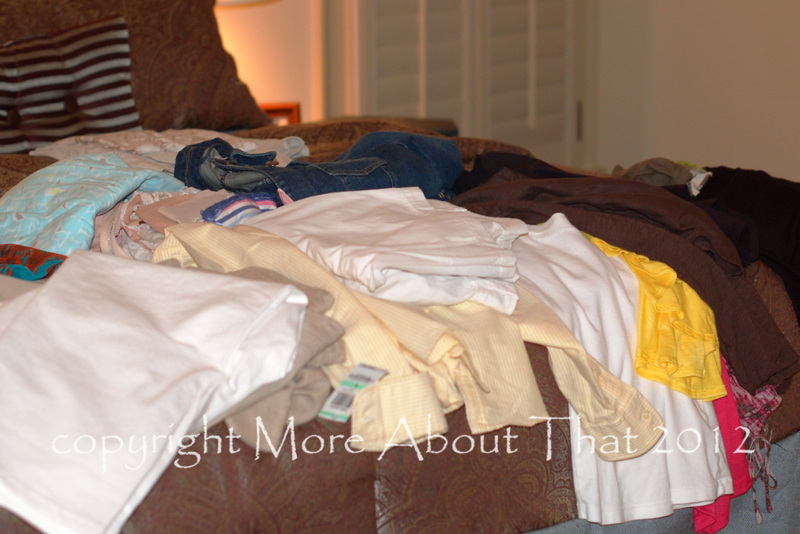 So what are your favorite travel and packing tips?